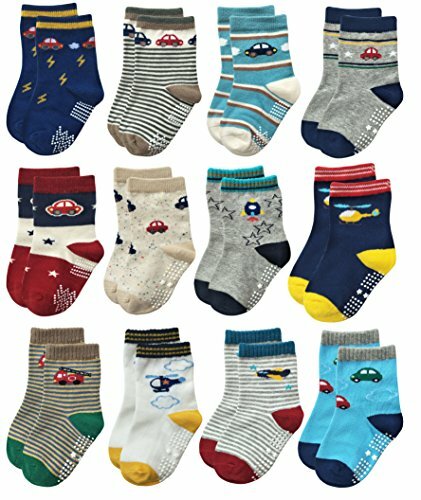 Deluxe Non Skid Anti Slip Slipper Cotton Crew Dress Socks with Grips for Baby Toddlers Kids Boys (9-18 Months, 12 designs/RB-71112) by Deluxe at Mas Fashion. MPN: 43224-21498. Hurry! Limited time offer. Offer valid only while supplies last. Material:95%cotton+5%spandex medium thickness available all season. Use of high quality knitted fabric is not torn or deformed to even wash by washing machine. If you have any questions about this product by Deluxe, contact us by completing and submitting the form below. If you are looking for a specif part number, please include it with your message.